I killed a demon. I don’t know if it was really, technically a demon, but I do know that he was some kind of monster, with fangs and claws and the whole bit, and he killed a lot of people. So I killed him. I think it was the right thing to do. At least the killing stopped.Well, it stopped for a while.In I Am Not a Serial Killer, John Wayne Cleaver saved his town from a murderer even more appalling than the serial killers he obsessively studies.But it turns out even demons have friends, and the disappearance of one has brought another to Clayton County. Soon there are new victims for John to work on at the mortuary and a new mystery to solve. But John has tasted death, and the dark nature he used as a weapon---the terrifying persona he calls “Mr. 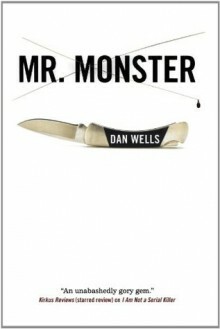 Monster”---might now be using him.No one in Clayton is safe unless John can vanquish two nightmarish adversaries: the unknown demon he must hunt and the inner demon he can never escape.In this sequel to his brilliant debut, Dan Wells ups the ante with a thriller that is just as gripping and even more intense. He apologizes in advance for the nightmares. I think I liked this a little bit more than the first of the series. Hard to explain why, but there you have it. It's interesting to hear the voice of a protagonist who you simultaneously like and dislike and I definitely look forward to finding out what the future will bring for John.